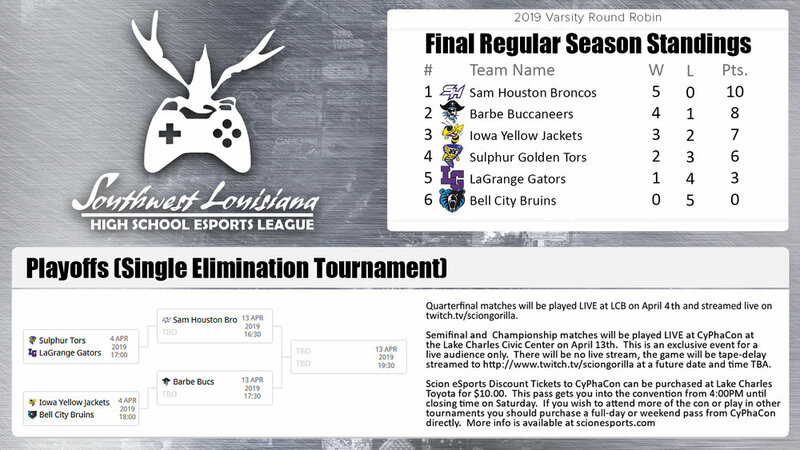 We are talking of course about the Southwest Louisiana High School eSports League. Elimination time is here and by April 5th we will know who will be playing for all the honor and glory at the exclusive live event at CyPhaCon on April 13th. Remember, the finals at CyPhaCon will not be streamed, this is an exclusive live event intended for the entertainment of the live convention audience only. You can buy a discounted ticket to the con from Lake Charles Toyota. All you have to do is come to the dealership and visit the cashier’s booth and ask to purchase a CyPhaCon wristband. Remember, the discounted passes will only get you into the convention from 4:00PM until closing time so if you want to visit more of the con you should consider purchasing a normal ticket from the event website.